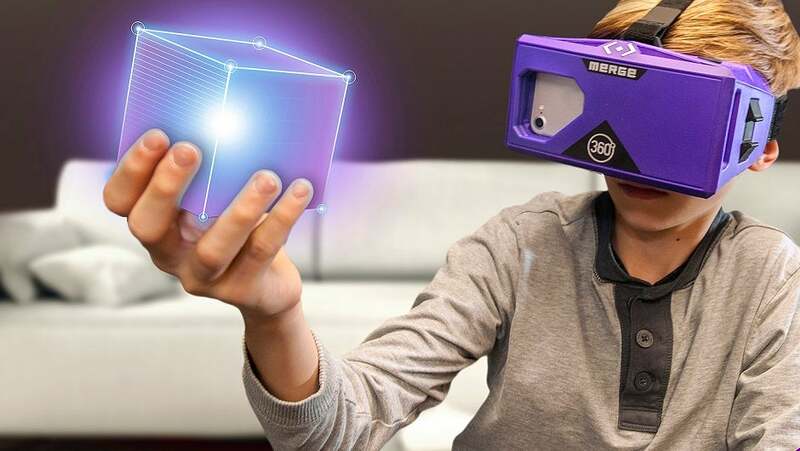 Yesterday, at CES, Merge VR announced their newest product and the world’s first holographic toy, the Holo Cube. It’s a form of augmented reality, since users can interact with a physical cube in order to register actions in a virtual world. This type of interface is rare in comparison to the ubiquitous touchscreen interface. Even free-finger hand tracking tech — a stunning example of which also debuted at CES this year — provides a different, less innovative interface. So why is a physical cube so ground breaking? Designer Bret Victor once called the touchscreen interface “a Novocaine drip to the wrist.” It’s a reference to the touchscreen’s flat, glass feel. There’s no haptic feedback to reward users for touching the right makeshift virtual button at any given point on the screen. The result is a subtle feeling of helpless isolation. Yet this version of a futuristic society is everywhere, from the latest Apple device to future-set science fiction flicks like Minority Report. Hand-tracking tech also appears in futuristic movies, like Iron Man’s hologram-based workshop. But that’s only an incremental improvement, replacing a glass sheet with nothing but empty air. What could the next step in user interfaces be? Sure, the Cube’s AR tech will need to continue to evolve beyond a kid’s toy, but it represents a different field of thought than the sleek glass interface of the touchscreen. Alternative interfaces include everything from audio-based AI to implantable brain chips to cardboard pizza boxes. But certain aspects of an interface have proven more popular than others. A static interface like a desktop computer loses out to a mobile interface like a smartphone, as proven when mobile officially beat out desktop traffic for the first time last October. Touch and sight are still among the most visceral senses. Barring Matrix-esque hologram brain implants, an augmented reality VR device like the Holo Cube could evolve into the most flexible, appealing user interface ever. Amazon has updated one of its best-selling Kindles, the Paperwhite, with water resistance and extra storage, but is it worth upgrading?